Sonny (whose real name was Joseph ) was born 89 years ago, one of six children to Patrick and Mary Molloy of St Brendan’s Road in Woodquay. He went to the ‘Mon’ where he learned to play football among other things. A match report in a local paper once carried the headline “Five Goal Molloy”, a fact which he managed to drop into conversation many times over the years. Chatting with him could be unnerving as he laced his chat with colourful sayings like “Long drawers”, “Bring up the bucket”, “Th’oul suit turned well”, ’44 short’, “I hate small men”, and of course his famous draper’s mantra, “We have your size”. In 1959 he was walking down by the river when he saw a 10-year-old boy struggling in the water. He immediately threw off his jacket and shoes and dived in and pulled the boy to safety. He was later awarded a certificate of bravery for this act of courage. He started his working career in James Naughton’s shop in High Street. After a number of years he moved up to Brennan’s in Shop Street as a charge hand. When James Naughton died, he was asked back to Naughton’s where he fell in love with and married a daughter of the house, Teddy. He and Teddy ran the business until they retired in 1997. Their shop was a jewel in the heart of Galway, full of Galway accents and native speakers, a magical cornucopia of traditional clothing, bales of material, canvas for your currach, ba?ini?ns, hobnail boots, long johns, double gusset knickers, hand knit socks. Sonny could discuss at length the most intimate details of underwear, be it male or female, in a very funny way without anyone taking offence. There was a lot of laughter in that shop. Much of the business done was with customers from Conamara or the Aran Islands and he often said that he never had a bad debt from those people. He was a famous boy soprano. He first broadcast on Radio E?ireann in 1940, and that same year, packed the Savoy in a concert. He was part of a choral group that once shared a stage with John McCormack, and later, he was a member of a group who organised many concerts for charity, people like Tom Lynskey, Sonny McLaughlin, Jimmy Walsh, Maura Nolan, Charlie Donoghue, Paddy Kelly, and Cepta Curran. He was a founder of the PMS and the Baroques. He was blessed with a wonderful tenor voice, superb delivery (he could sing in whispers ), and a wide repertoire. About 70 years ago, he was introduced to the Augustinian Choir by the organist, Jean Byrne, and under their tutorship, and later that of Pat Lillis, the choir built up a formidable reputation. 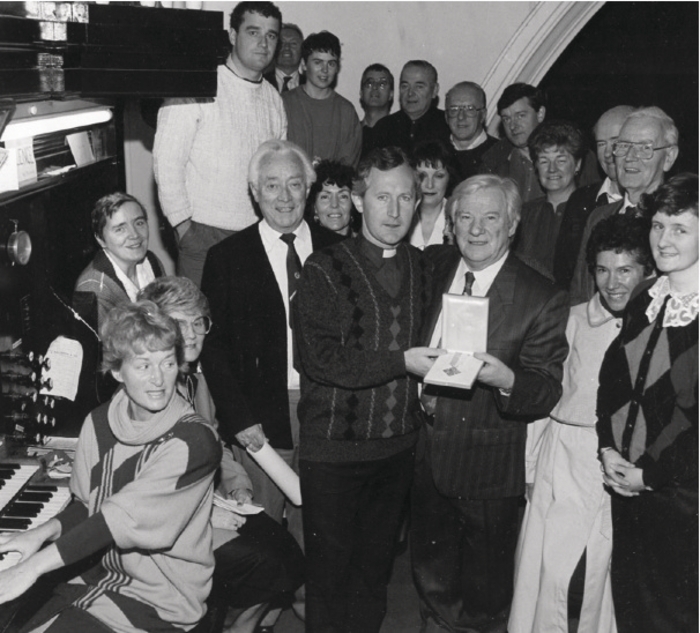 Our photograph shows him receiving a Papal Bene Merenti medal from Fr Flor O’Callaghan in 1991 for his services to the choir. He is surrounded by choir members Pat Lillis, Joan Armitage, Anne McManus, Seamas Cahalane, Noel O’Rourke, Marie O’Toole, Brian Stewart, Cathal Cunningham, John Armitage, John Grealish, Michael Staunton, Jimmy Dooley, Francine Ryan, Mary O’Leary, Gerry Glynn, Anne Duggan, and Mary Cantwell. Sonny was the subject of a beautiful TV documentary made by Donal Haughey which managed to have three world premieres in one day. He was a Galway original, a character, a people person, great company, a warm and wonderful presence on High Street. He loved life and lived it to the full until he was diagnosed with cancer three months ago. He passed away last week in the wonderful care of the staff of Galway Hospice. Ni? fheichfidh muid a leithe?id ari?s. Things will be quieter on High Street now.